Great Basin College officials are trumpeting another record year of certificates and degrees for the spring semester as students prepare for Saturday’s graduation ceremony. According to the college, the number of students graduating has either maintained or increased in all of Great Basin’s service areas. 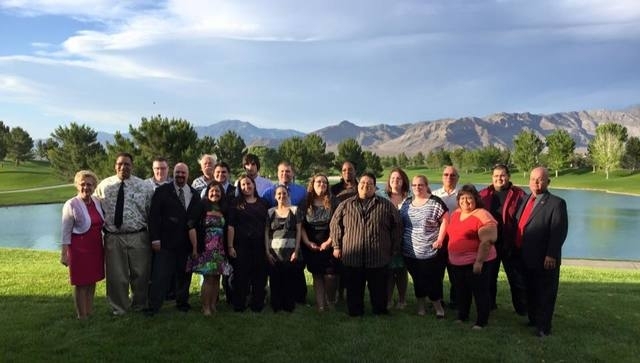 Pahrump’s campus accounted for 52 degrees and 21 certificates, many of whom were honored with a dinner at Mountain Falls Golf Club on Saturday. Pahrump campus manager Diane Wrightman said she attributes the increase of graduates to the school’s higher profile in recent years. Based on applications this year, officials estimate they will award 59 bachelor degrees plus one post-bachelor certificate (up from 57 in 2014), 304 associate degrees (up from 273) and 190 certificates (up from 188). This year the college received applications for 553 certificates and degrees, an increase of 33 students when compared to last year’s 520 applications. Wrightman said individuals from Clark County are also interested in what Great Basin has to offer, while noting the fields of study vary from student to student. Officials in northern Nevada also noted the Winnemucca campus has experienced an increase that nearly doubles that of last year. College President Mark Curtis said he applauds the effort of faculty and staff, who’ve endured budget cuts and still maintained a high level of excellence in the classroom and online. “The college’s faculty and staff have worked hard to do more with less. They believe deeply in the mission of the college and are not easily distracted by year-after-year budget cuts,” Curtis said. “Students are showing a preference for the convenience of online courses, minimizing the need for travel and maximizing personal convenience,” Curtis said. Wrightman said officials at all of Great Basin’s campuses are encouraging students to take a full load of classes, for their own benefit. Last week, the Pahrump campus held a graduation dinner for graduates who preferred not to travel to Elko’s campus for the official graduation ceremony on Saturday. The Elko graduation ceremony will take place at 10 a.m. Saturday in the Elko Convention Center. The total number of students who applied to graduate is 445. Some students will have dual credit and will receive a certificate and a degree, or multiple degrees. Wrightman said this year a new program is attracting much interest among students interested in one particular field of medicine. Officials anticipate about 251 students will walk across the stage to receive their diplomas at the ceremony Saturday. For the first time in the history of Great Basin College’s commencements, the ceremony on Saturday will be streamed live and can be viewed by visiting www.gbcnv.edu.